The numbers are in, and according to my calculations this is the fifth hottest July Rockford has seen since records began in 1906. Our average temperature (highs and lows together, divided by 31) was 78.9. That's 6.1 degrees above the long-term average. Speaking of long-term averages, those will be changing starting tomorrow, as we explained in a previous post. TEMPERATURES CLIMBING INTO THE 90S. THIS COMBINED WITH DEW POINTS IN THE 70S WILL CREATE HEAT INDEX VALUES OF AROUND 100 TO 105. HEAT INDEX VALUES APPROACHING OR POSSIBLY EXCEEDING 110 DEGREES. HUMID CONDITIONS FOR THE REST OF THE WEEK. EVENING WHEN A COLD FRONT MOVES THROUGH. THE 70S... PROVIDING LITTLE RELIEF. INCREASE THE RISK FOR HEAT RELATED ILLNESSES. The National Climatic Data Center (NCDC) is responsible for producing 30 year climate normals of numerous climatological variables every 10 years for U.S. locations. The primary variables include temperature, precipitation, and derived products such as heating and cooling degree days. Normals serve as a baseline average of important climate variables that are used to understand average climate conditions at any location and serve as a consistent point of reference. In this latest set of normals (1980-2010), the 1971-1980 decade was removed (generally considered a cool decade) and the 2000-2010 decade was added (warmer by comparison). As a result, the 1980-2010 average temperature across the United States is now approximately 0.5 F degrees warmer than the 1971-2000 period. However, this warming is not uniform across the country or from season to season. For instance, the 1981-2010 average high temperature for the mid section of the U.S. is cooler in July compared to the previous set of normals. Meanwhile, the January normal lows are much warmer across the Northern Plains and Upper Mississippi River Valley compared to 1971-2000. The graphics below illustrate the changes, along with the overall warming by state from the old set of normals to the new set. Do these two images look sort of similar? The top left is the 72 hour rainfall totals from last year when major flooding occurred over northeast Iowa and northern Illinois. The second one is the doppler estimated rainfall totals from late Tuesday night through 9am Thursday morning. The areas that were hardest hit last year during the July 22nd through July 25th rain event were, for the most part, hit hard with this last storm. The heavy rain last year did extend a little further east into the Rockford area. This year the heaviest rain was more confined to northwest Illinois. Record amounts of rain fell late Wednesday night/early Thursday at Dubuque where a 24-hour total of 10.62" was recorded. Even some locations in and around that area and further east in Jo Daviess county and Stephenson county had some very impressive totals. So why exactly did so much rain fall in such a short amount of time? During the afternoon hours on Wednesday a warm front lifted north out of central Illinois and southern Iowa. While it wasn't too muggy during the morning hours it sure did turn humid later that afternoon. Storms from earlier in the day out west created what's known as an MCV (Mesoscale Convective Vortices). The MCV moved through Iowa before entering into southern Wisconsin. The associated cloud cover from that kept the front from lifting much further past the Wisconsin/Illinois border. It also aided in generating the lift needed to get storms to fire. As this was occurring, the low level jet developed and was the main transport of moisture from the gulf. We also had a lot of atmospheric moisture which helped storms become very efficient rain producers. As the low level jet picked up, it actually intersected the now stalled boundary right around the Dubuque area. As the storms developed they then moved east along that boundary, which because of the temperature difference created a very steep instability gradient, into northwest Illinois. This occurred for several hours and is known as 'training'. This is when storms move over the same locations. It wasn't until later Thursday morning that the rain finally began to tapper off. Yesterday I was a little concerned that the same thing might happen again into Friday morning. Thankfully it didn't, and this is why. That same boundary had actually been shifted further south of the area due to the morning storms. The associated cloud cover helped to stabilize our atmosphere and we didn't have as much instability like the night before. As the low level jet started up it was actually focused a little further to the east, instead of pointing into northeast Iowa. 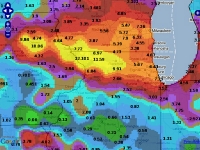 While we did have a few storms roll through late Thursday evening a lot of the heavier rainfall during the overnight was focused more towards Chicago and northwest Indiana. This caused that boundary to 'light up' with activity through northern Missouri, central Illinois, northern Indiana and southern Michigan earlier this morning. Now as high pressure moves in it should continue to push the front further to the south this afternoon and into the first part of the weekend. First Tropical System to Hit the U.S. Tropical Storm Don continues to spin in the Gulf of Mexico this morning. Moving to the west/northwest around 14 mph maximum wind speeds are around 50 mph and the pressure is at 1000mb. Tropical Storm Don is not expected to reach hurricane strength before reaching the coast of Texas early Saturday morning because there is a fair amount of wind shear within the atmosphere. The combination of shear and dry air aloft will likely limit the intensification of Don, despite it moving through warm waters. High pressure located across the U.S. will help to steer Don west/northwest until making landfall, where it is expected to weaken once it reaches Mexico. Tropical Storm Warnings have been issued for areas along the southern coast of Texas. This may actually be some good news for residents there as the extreme drought has been a big problem for people in the southern Plains. Some much needed rainfall may help alleviate some of those drought conditions, at least for extreme southern Texas. Thanks to the cloud cover that dominated for much of the day today, we're a little to stable for big, heavy-rain-producing thunderstorms in my opinion. We did see a few storms fire in Iowa earlier this evening, only to see them fizzle in the more stable atmosphere almost as soon as they developed. On the other hand, a few storms that are developing right now in the Madison area ahead of an approaching cold front could be indicative of storms pushing into the area later tonight. So although our chances of heavy rain are waning somewhat, we're not completely in the clear just yet. We will continue to watch things! THE NATIONAL WEATHER SERVICE IN THE QUAD CITIES HAS ISSUED A FLASH FLOOD WARNING FOR A LEVEE FAILURE IN WESTERN CARROLL COUNTY IN NORTHWEST ILLINOIS UNTIL 115 AM CDT FRIDAY. CAUSING FLASH FLOODING OF IMMEDIATELY SURROUNDING AREAS. IF YOU ENCOUNTER A FLOODED ROADWAY...TURN AROUND AND FIND AN ALTERNATE ROUTE. TURN AROUND...DON/T DROWN. THE PECATONICA RIVER AT FREEPORT. * AT 4:30 PM THURSDAY THE STAGE WAS 12.7 FEET...AND RISING. 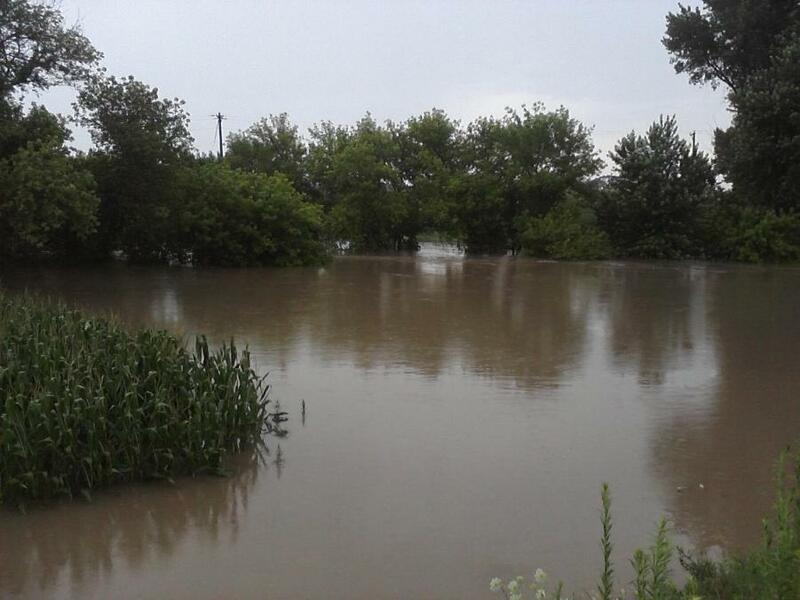 WATER AFFECTS A FEW BACK YARDS EAST OF THE PECATONICA RIVER. Thunderstorms have developed once again to our southwest and are moving through southern Whiteside county moving to the east/northeast at 35 mph. Radar estimates between one half and one inch of rain has fallen in the past hour. We could get up to another inch from this storm. ANYONE WHO OBSERVED THE STORM AS IT PASSED THROUGH THE AREA FROM THE EVENING ON WEDNESDAY TO THE EARLY MORNING HOURS OF THURSDAY CAN ATTEST THAT IT WAS A SPECTACULAR LIGHTNING EVENT. DURING THE 12 HOUR PERIOD FROM 6PM ON WEDNESDAY TO 6AM ON THURSDAY MORNING...68028 LIGHTNING BOLTS OCCURRED OVER THE EASTERN IOWA...SOUTHERN WISCONSIN...AND NORTHERN ILLINOIS REGION. Flash Flood Watch continues and has actually been extended for all of southern Wisconsin and northern Illinois through Friday morning. Scattered showers will continue through mid-morning before skies partially clear before noon. (11:10:05 AM) nwsbot: LOT: Nw Rockford [Winnebago Co, IL] trained spotter reports HEAVY RAIN of M1.73 INCH at 10:41 AM CDT -- delayed report. storm total. (7:54:02 AM) nwsbot: LOT: Kingston [De Kalb Co, IL] broadcast media reports HEAVY RAIN of M1.50 INCH at 05:55 AM CDT -- storm total. relayed public report. (7:54:02 AM) nwsbot: LOT: Rockford [Winnebago Co, IL] broadcast media reports HEAVY RAIN of M2.10 INCH at 05:55 AM CDT -- storm total. relayed public report. (7:54:02 AM) nwsbot: LOT: Genoa [De Kalb Co, IL] broadcast media reports HEAVY RAIN of M1.00 INCH at 05:55 AM CDT -- storm total. relayed public report. (7:54:02 AM) nwsbot: LOT: Dixon [Lee Co, IL] broadcast media reports HEAVY RAIN of M2.70 INCH at 07:10 AM CDT -- storm total. relayed public report. raining heavily at time of report. (7:11:25 AM) nwsbot: DVN: N Shannon [Carroll Co, IL] trained spotter reports HEAVY RAIN of M4.10 INCH at 07:00 AM CDT -- 24 hour total. (7:10:33 AM) nwsbot: DVN: 2 Ese Galena [Jo Daviess Co, IL] co-op observer reports HEAVY RAIN of M13.45 INCH at 07:00 AM CDT -- 24 hour total. (7:06:42 AM) nwsbot: DVN: Galena [Jo Daviess Co, IL] co-op observer reports HEAVY RAIN of M13.45 INCH at 07:05 AM CDT -- light to moderate rain continues. (5:37:12 AM) nwsbot: DVN: Mount Carroll [Carroll Co, IL] law enforcement reports FLASH FLOOD at 05:18 AM CDT -- north of mount carroll rt 78 is closed. north of mount carroll loran road closed. (5:38:51 AM) nwsbot: DVN: Elizabeth [Jo Daviess Co, IL] law enforcement reports FLASH FLOOD at 05:18 AM CDT -- rt 84 washed out near elizabeth. Flood Warning for urban areas and small streams has been issued for Jo Daviess, Stephenson and Carroll through 4pm. CLOSURES CONTINUE WITH NUMEROUS WASHED OUT BRIDGES. LARGE AREAS OF LOW LYING LAND ARE COVERED IN WATER. INDIVIDUALS ARE URGED NOT TO TRAVEL AND TO GO TO HIGH GROUND FOR THE NEXT SEVERAL HOURS UNTIL THE WATER RECEDES. THE RAIN IS EASING AND SHOULD END ENTIRELY OVER THE NEXT COUPLE OF HOURS. According to ComEd 18,500 are still without power this morning; 21,700 were originally without power. Within Rockford city limits 13,300 are without power. 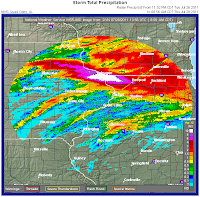 3:35am: The image on the left is the radar rainfall estimate from 8:30pm last night through 3:30am this morning. 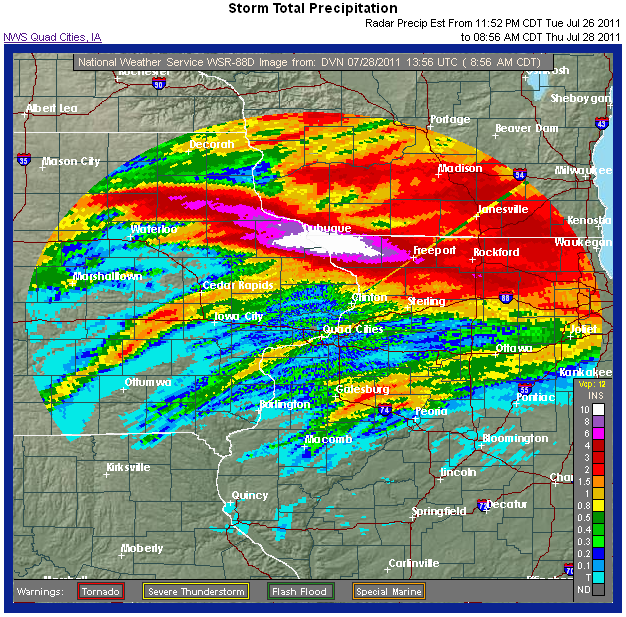 Doppler radar is indicating that close to 10" of rain has fallen across sections of Jo Daviess county. Flash Flood Warnings continue for Jo Daviess, Stephenson, Winnebago and Carroll counties. 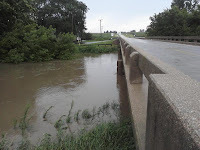 Many of the reports coming in have been from western Stephenson county near Lena of water standing over rural roads and in Pearl City where the Yellow Creek has gone over its bank. Earlier in the evening evacuations were being conducted. Numerous flooding reports coming out of Jo Daviess county. Storms continue to move across northern Illinois. 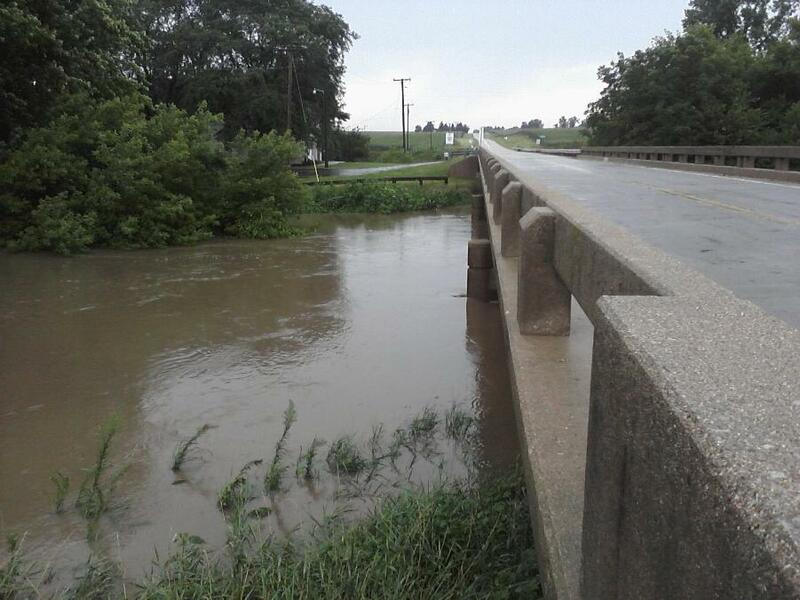 Major flooding has been occurring across Jo Daviess and Stephenson counties. Storms will Continue to train over these same locations for the next several hours. When thunderstorms continue to move over the same area, meteorologists refer to this as "training". Unfortunately, it looks like that is what we are dealing with early this morning. A stalled front near the Illinois/Wisconsin line combined with a strong low-level jet fueling moisture and instability into eastern Iowa is generating thunderstorms that continue to move from eastern Iowa across northern Illinois. The ground is already saturated across much of the Stateline due to heavy rains earlier in the week, especially to the north of Rockford. Any additional rainfall will quickly drain into creeks, streams, and rivers that are running high and could cause flash-flooding at a moment's notice. Some areas could see in excess of 4" of rainfall. The tornado watch that was in-effect for Lee, Ogle, and DeKalb counties has been allowed to expire. Here is a list of storm reports thus far. In addition to these, I also had a report that the north side of Pearl City is underwater, and that Yellow Creek is over its banks. In addition, power is out in many areas in Winnebago county (at an estimated 6000 residences). ETHEL. TIME ESTIMATED FROM RADAR. AREA NEAR ARLINGTON STREET. TIME ESTIMATED FROM RADAR. TREES DOWN BLOCKING WESTBOUND LANE OF WEST STATE STREET NEAR WELDON ROAD. TIME APPROXIMATED FROM RADAR. M71.00 MPH NEAR I-90 AND RIVERSIDE. 07/27/2011 WINNEBAGO IL TRAINED SPOTTER BRANCHES AND GARBAGE FLYING. ESTIMATED 75 MPH WINDS. RECEIVED FROM ROSCOE IN NORTHEAST WINNEBAGO COUNTY AT 920 PM CDT. ROCK CITY...LENA...DAVIS...DAKOTA...CEDARVILLE AND LAKE SUMMERSET. AGENCY FOR RELAY TO THE NATIONAL WEATHER SERVICE. The Storm Prediction Center out of Norman, Oklahoma has issued a tornado watch for all Stateline counties until 1:00am. Very warm and unstable air over the area along with rotating winds with height is producing an atmosphere favorable for possible tornadoes. A tornado was already sighted this evening 6 miles northwest of Galena at 7:18pm. We will keep you posted on any further tornado sightings and/or warnings. 7pm Update: The NWS offices out of Milwaukee and the Quad Cities are also on board with this Flash Flood Watch. Green and Rock counties are under this watch through tomorrow morning. Stephenson, Jo Daviess, Carroll, and Whiteside counties are in this watch through tomorrow afternoon. In anticipation of the rainfall expected the next 36 hours the Chicago NWS has issued a Flash Flood Watch to go into effect at 4pm this afternoon and last through 1pm Thursday. Some locations this morning received several inches of rainfall, mainly northeast of here, from the storms this morning. Conditions will be watched out west across Iowa later today. Depending on where the storms develop will help determine further development across our area this evening. It hasn't been too active, so far, in the Atlantic but that might change later this evening. Storm activity associated with a tropical wave will likely become better organized later this afternoon as radar data from Mexico is suggesting a circulation could be forming northeast of Cancun. If these trends were to continue we could have a tropical depression form later today. The National Hurricane Center is giving this wave an 80% of becoming a tropical cyclone within the next 48 hours. An Air Force Reserve Hurricane Hunter aircraft is scheduled to investigate this system later. If it does form into a tropical cyclone, the hurricane forecast models are placing its path along the Texas coast. This may help bring some rain, although it would be heavy, to drought stricken Texas. After some heavy rainfall this morning, the storms have now moved east of I-39. Clouds thin some later this morning and afternoon and as a warm front moves north. The heavy rain in central and northern Wisconsin will likely slow the progression of the warm front some as the heat and instability build behind it. The image on the left shows the 850mb moisture transport. Basically all you really need to know is the areas shaded in pink are the regions of higher moisture transport. This is important because this is where the heavy rain could be possible later this evening and overnight. Studies have shown that higher values of moisture transport have been related to heavy rainfall events. A slight risk of stronger storms still remains across southern Wisconsin and northern Illinois for later this afternoon and into the evening. As skies continue to clear any outflow boundaries from the storms to our north could interact with the warm front to help ignite more storms later this afternoon/evening. Should storms form strong winds and heavy rainfall would be of primary concerns. We'll continue to monitor trends to the north and northwest across Iowa, Wisconsin and Minnesota for any development later this afternoon. Just be aware that some areas across the region could be dealing with substantial amounts of rain within the next 36 hours. Our report, Marty Kasper, caught these pictures as he was heading north on I-39 this morning. As a warm front lifts through the area this morning scattered showers and thunderstorms have developed out ahead it. Severe weather is not anticipated, however, gusty winds and heavy rainfall will be possible. These should pass mid-morning with the potential for more storms later this afternoon. This is the preliminary local climate data summary for Dallas/Fort Worth, TX. Notice anything?? The past 24 days have recorded high temperatures of 100° or higher! The only day when the mercury didn't reach 100° was the first of July when they reached 98°. Even back in June, there was a stretch of 100° weather surrounded by upper 90s. Sure does make the muggy weather we've had seem like a piece of cake. A warm front lies well to our southwest early this morning but a little moisture pooling out ahead of it in northeast Iowa and southwest Wisconsin have allowed a few showers and storms to pop up. These will continue to move southeast through through 8am and may cause a brief downpour. Skies will remain partly cloudy through the afternoon and as that warm front moves closer later today an isolated thunderstorm will remain possible through this evening. July 2011 has featured an average temperature in Rockford of 79.0 degrees. Preliminarily, that's 6.2 degrees above the long-term average, and tied for the 4th hottest July since records began in Rockford back in 1906! Granted, there are still six days remaining in the month. But with above-average temperatures expected to continue into the weekend, this will likely be the 4th or 5th hottest July on record. Last July, as you may recall, was quite hot as well. At 75.4 degrees, it was the 20th hottest July in over 100 years of record-keeping. But July 2009 was our coldest July ever at 67.0 degrees, beating-out our 2nd coldest seventh month (July 1915) by a full two degrees! The first three weeks of July were very dry. We had only received a total of 0.19" during that time (records kept at the RFD airport). This past weekend we made up for that in a short amount of time. Even though we're still a little short of where we should be, many locations picked up several inches of rain from what fell Friday morning through Sunday morning. So what changed to allow that much rain to fall? Temperatures have been running above average all month as a ridge of high pressure has been very dominant across the Midwest. This has kept the active storm track, and the heavy rainfall, to our north. At the end of last week that ridge shifted south and east bringing the extreme heat to the Mid-Atlantic and east coast. As storms formed out west in Iowa and the central Plains during the evening hours they moved right over top the Stateline during the overnight. The storms maintained their strength through the overnight due to the heat to the south as well as the moisture feed from the low level jet. High pressure the next couple of days will allow us to dry out some but some indications are suggesting the middle of this week could bring some heavy rainfall once again. The thunderstorms that rolled through the Stateline overnight into the morning hours have left some areas with localized flooding for the second overnight in a row. A weak cool front is settling southward across Illinois tonight. High pressure over Minnesota will cause skies to become partly cloudy along with a light north wind. Because of all the moisture left over from recent heavy rains, areas of fog will develop late tonight through the early daylight hours on Monday. Some of the fog could be locally dense. The fog areas will burn off fairly quickly on Monday morning leaving the skies sunny. It will be a little less humid on Monday, and afternoon temperatures will top out in the upper 80's. High pressure will slide from Illinois on Monday night to southern Ohio by Tuesday morning. It will be clear overnight, and mostly sunny on Tuesday. With the high to our east a warm front will begin to approach from the southwest, and dew points will start to rise again. High temperatures will be in the upper 80's again. The front will make very little progress northward on Tuesday, but it will start to get more of a kick overnight into Wednesday morning. There will be chances of showers and thunderstorms from time to time from Wednesday through Friday. If recent past experience follows the same pattern, the best chances will be with overnight convective complexes that have the potential of producing severe thunderstorms and more heavy rain with this juiced up atmosphere. Daytime temperatures will be in the upper 80's to the low 90's, and dew points will be in the mid to upper 70's producing afternoon heat indexes close to 100. Next weekend looks like it will be sunny to mostly sunny and very warm. The thunderstorms that rolled through the Stateline overnight into the morning hours have left some areas with localized flooding.. There is still a very rich moisture environment across the Stateline, and thunderstorms may develop into the are later tonight. There is potential for heavy rainfall with any thunderstorm clusters that do form, The low will be around 74 degrees. On Sunday a cool front will approach from the west. Scattered thunderstorms will develop in advance of frontal passage which should occur early in the afternoon. It will be partly cloudy, hot and humid with a high around 90 degrees. High pressure over the northern plains will bring cooler air under clear skies on Sunday night. The air conditioners will get a break as temperatures drop into the low 60's. High pressure will be sitting right over the area on Monday. It will be a beautiful sunny day with comfortable humidity levels along with an afternoon temperature in the middle 80's. The Severe Thunderstorm Warning for northeast Lee, southern Boone, southeastern Winnebago, eastern Ogle, and southwestern McHenry counties is cancelled. These storms have weekend below severe criteria. However, the flash flood warning is still active. With this line of storms, 50 to 60 mph winds were reported near Freeport, 50 mph winds at Machesney Park, and 0.25" hail at Forreston. THAT FELL ACROSS PARTS OF NORTHERN ILLINOIS FRIDAY MORNING. OCCUR ACROSS MANY AREAS NORTH OF INTERSTATE 88 AND INTERSTATE 290. ROADWAY. THE WATER DEPTH MAY BE TOO GREAT TO ALLOW YOUR CAR TO CROSS. FRANKLIN GROVE...AND MOVING EAST AT 40 MPH. Thunderstorms capable of producing 60mph winds and small hail in eastern Iowa continue to move to the east and southeast tonight. With plenty of moisture in place (dewpoints are well into the 70s at this hour) and an upper-level disturbance moving across the Mississippi River tonight, these storms may maintain their severe characteristics as they head into northern Illinois late this evening and early Saturday morning. Although some of the most potent storms may curve southeast of our area, brief heavy downpours are still possible after midnight as more showers and storms move toward our area. We'll continue to watch things. The rain from this morning has ended and a lot of areas, especially north of Highway 20, picked up over an inch of rain! The image on the left is a radar estimate of the showers that fell this morning. Notice a lot of the heavier rain fell closer to the Wisconsin/Illinois border; although there are a few higher spots to the south and southwest. Mt. Morris (Ogle Co.) 0.9"
Loves Park (Winnebago Co.) 1.3"
8:30am Update: The main line of storms is now east of Rockford moving into western McHenry and DeKalb counties. Noticing a little bit of shear (changing of winds) out ahead of this line. It could create a few strong gusts along that leading edge as it continues to move east. We'll continue to monitor it in the weather center. 7:33:05 AM) nwsbot: LOT: 7 W Rockton [Winnebago Co, IL] co-op observer reports HEAVY RAIN of M0.92 INCH at 05:30 AM CDT -- measured by shirland co-op observer. With the heavier rain showers this morning, there may be a little localized flooding. These storms will continue through this morning. Rain and even a few thunderstorms will continue to move through southern Wisconsin and northern Illinois this morning. While nothing severe is anticipated with these storms, heavy rainfall and gusty winds will remain possible. Some of the stronger cells may produce pea sized hail. These are all forming north of a stationary boundary that is currently to our south. I am anticipating some sunshine will return later which may help a few more storms fester later this morning and afternoon. Should storms form later this afternoon along a few of the old outflow boundaries some may contain gusty winds. ﻿﻿ These photos were taken shortly before 6am this morning just west of Freeport on Pearl City Road. This is a shelf cloud which may indicate a few gusty winds with some of these storms. A record high minimum temperature was tentatively set this morning at the Rockford airport. The mercury dropped to just 80 degrees this morning. Assuming we don't get colder than this tonight with thunderstorms expected later on, this record will stand. Even if we do drop below 80, as long as we stay at or above 77 degrees this evening we will set or tie the old record. 1:10pm Update: There have still been no confirmed reports of a tornado or damage coming in to us as of 1pm. The large scale set-up does not support much development for tornadoes this afternoon. However, as the storm was moving through it was falling apart some so there could have been a period of strong wind gusts in a localized area. Also, there was a boundary near that area so it's possible, and with all the unstable air, that a very weak tornado may have formed. There was a very strong inflow into the storm. We're still working to confirm things this afternoon. The skies are beginning to clear out behind this line. A line of thunderstorms extends from South Beloit to Winnebago and is moving east at 45 mph. Hail pea to nickel sized, gusty winds and heavy downpours could be possible. The extreme heat and humidity we've felt the past two days has now begun to shift a little further east today as a weak cool front slides in from the northwest. This will help provide some relief from the heat, although it is still going to be very hot out this afternoon. An Excessive Heat Warning continues for Carroll, Whiteside, Winnebago, Ogle, Boone, McHenry, Lee and DeKalb counties through this evening while a Heat Advisory continues to Rock and Walworth counties. Jo Daviess, Stephenson and Green counties have been dropped from the advisory/warning because the cool front has already pushed through. This front will be the focus of possibly a few storms later this afternoon and overnight. 11:35am Update: Thunderstorms currently moving into extreme northeast Stephenson county will affect sections of far northwest Winnebago county within the next 30 minutes. Brief heavy downpour along with frequent lightning will remain possible. 11:00am Update: The showers that were in Iowa continue to move northeast into southwest Wisconsin and northwest Illinois that this afternoon. These will continue to affect sections of Jo Daviess and Stephenson counties and Green county in Wisconsin. First off: Excessive Heat Warning continues for all of the northern Illinois counties through this evening. Heat Advisory has now been issued for Green, Rock and Walworth counties in southern Wisconsin. Temperatures are expected to rise into the middle and possibly upper 90s this afternoon with the heat index nearing 100°. This will be ahead of a weak cold front that will move through later this afternoon. Sunny skies and a very humid air mass are in place across northern Illinois and that is what could help fuel a few storms later today. Storms fired up early this morning along the cold front in eastern Nebraska and western Iowa. They are currently moving to the northeast and are now just west of Dubuque. While the front itself won't likely be here until mid-afternoon, there are some outflow boundaries that are forming from the rain cooled air. Within the past 20 minutes I have noticed that a few more storm cells have popped up along this boundary in eastern Iowa. While they are a ways away there may be a couple storms that move close to our counties near the Mississippi River. That's why I'm going to keep the storm chance going through this afternoon. As the front passes it will stall to our south overnight and should another storm complex develop out in the Plains later this evening, it would follow that boundary. This *could give us a heavy rain threat by early Friday morning. If these storms don't develop, then we would likely not see any rain from it. Storm chances will continue through the weekend until the front passes late on Sunday. Although we came up a couple of degrees shy of our record 102-degree high set back in 1930, we managed to touch the century mark for the second day in a row in Rockford! That's quite a feat, considering we've gone 22 years without experiencing 100-degree heat! Heat indices continue to flirt with 110 today, due to the high humidity. Tomorrow looks slightly cooler with more clouds, then an upper-level disturbance could bring some thunderstorm activity to the area by tomorrow night. Mr. Burns’s instructions were simple: Take cover. Ms. Eller, 51, rushed to a closet with her mother, two sisters and four dogs. “All of the sudden you hear the glass shattering and wood cracking and the trees just rattling,” she said. Every room in the house was wrecked, except the space that held her family. Increasingly, the weather is becoming a bigger part of the national conversation. As scientists explore the implications of climate change and severe weather’s effect on everything from crops to urban infrastructure, broadcast meteorologists like Mr. Burns are the ones who bring it home every day in eye-popping computer graphics. Gone are the days when the local weather guy had to climb on a tricycle at the clown parade, and Diane Sawyer, who got her start delivering forecasts in Louisville, Ky., was called a weather bunny. Now, the forecaster is the egghead of the newsroom. Most have advanced degrees that include courses in calculus and atmospheric thermodynamics. Mr. Burns, a man with affection for Porsches and astrophysics, has for 30 years predicted the weather for viewers in the Atlanta area. In the old days, he used to have to wait for his turn in the newscast, slap a magnetic sun on a map and hope it didn’t rain. Now he presides over a new $1.7 million radar system and has more real estate on the set than the newscasters have. As that kind of technology offers the ability to predict with great precision how a severe storm will move, the weather forecast has become about saving lives. Like firefighters or war heroes, meteorologists talk a lot among themselves about a job that has turned from explaining the finer points of a jet stream to one where lives depend on it. “If somebody is hurt or killed by severe weather, there isn’t a person among us who doesn’t think, ‘What could I have done differently? What could I have done better?’ ” said Jay Trobec, meteorologist for KELO-TV in Sioux Falls, S.D., and commissioner for professional affairs for the American Meteorological Society, which certifies broadcasters who deliver the weather. Exactly when the role changed from the guy who fouled up weekend plans with a botched forecast to community hero remains a topic of debate. But part of the evolution can be traced to the late 1980s when Doppler radar — a term even the casual viewer knows but perhaps does not understand — became a tool for broadcast meteorologists. The radar technology, named after an effect noted by a 19th-century Austrian physicist, is a way to measure speed and direction. It allowed local forecasters to be more precise. Whereas the technology was once a rarity, now about 350 of the nation’s 762 television stations that produce local news own Doppler radar systems, Mr. Trobec said. Certainly the Weather Channel, which made its debut in 1982, has made the weather game more competitive. But meteorologists maintain that there is nothing like a local forecast from someone in the community. Changing weather has had something to do with the popularity of local forecasts, too. “When this El Niño stuff started popping up a lot in the 1990s, that’s when weather started to really have a presence,” said Monica Pearson, a veteran newscaster who has worked with Mr. Burns in Atlanta since he arrived at the station in 1981. And that is how it should be, said Mr. Burns, whose fascination with weather began when he was a boy hanging out at the Miami television station his father used to run. An evening on the WSB-TV news set makes that clear. From late afternoon to the 11 p.m. broadcast, Mr. Burns dominates. He runs his empire from two consoles of computer screens that rival a Star Trek set. His equipment has names like StormTracker 2HD. At its heart is something called Klystron dual-polarization Doppler. His is one of two stations in the country that have installed it. He is even ahead of the National Weather Service, which over the next couple of years will be upgrading its 160 radar stations with the same technology at a cost of about $40 million. It was that radar, installed only a few days before the deadly storms tore through Georgia in April that allowed Mr. Burns to warn people like Ms. Ellis. Of course, not everyone is impressed with the technological wizardry. The station’s new radar was the subject of a lively discussion at Radio-Info.com, an online community for broadcast professionals. And sometimes, people just want to know if it is going to rain over the weekend. And they hold the forecaster personally responsible when it does. “I get people asking me every day, ‘Why don’t you do something about this?’ ” said Marshall McPeek, a popular forecaster in Columbus, Ohio. Tuesday morning was a foggy one for many across the Great Lakes. 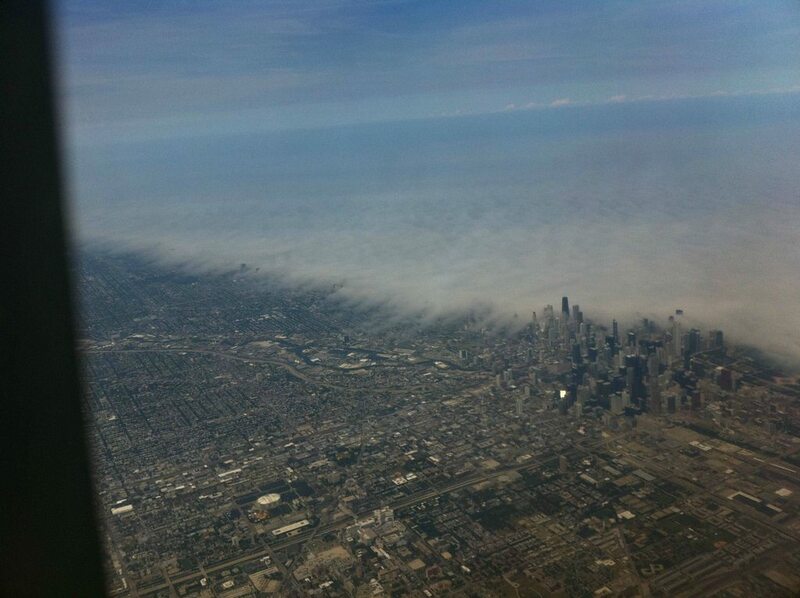 This is a picture of the fog as it was rolling into Chicago! Pretty cool! It actually stayed around through a good part of the day in some spots along Lake Michigan. So far there have been at least 13 fatalities possibly related to the heat across the Midwest and after reaching 100° Tuesday afternoon, temperatures will be in the same territory once again today. That's why the Excessive Heat Warnings will continue through Thursday evening. A break will finally come, from the humidity at least, early next week but some indications are suggesting that another warm up will be in the makings around the first week of August. 2:00am Update: The line of storms that prompted the Severe Thunderstorm Watch will continue to move to our east. As a result the watch has been cancelled for our counties. Boone and McHenry counties are under a severe thunderstorm watch until 3am. A line of thunderstorms now in central Wisconsin is moving to the southeast at 50mph. These storms have had a history of producing 60mph winds in northwest Wisconsin earlier this evening, along with frequent lightning and heavy downpours. Although these storms appear to be weakening somewhat and may miss the area to the east, we will continue to monitor these storms. ADVISORY REMAINS IN EFFECT TONIGHT UNTIL 7 AM CDT WEDNESDAY. WITH LOWS IN THE MIDDLE OR UPPER 70S. WATER. IN ADDITION CHECK UP ON RELATIVES...ELDERLY AND NEIGHBORS. SITUATION IN WHICH HEAT ILLNESSES ARE POSSIBLE. DRINK PLENTY OFFLUIDS...STAY IN AN AIR-CONDITIONED ROOM...STAY OUT OF THE SUN... AND CHECK UP ON RELATIVES AND NEIGHBORS. CHILDREN AND PETS SHOULD NEVER BE LEFT UNATTENDED IN VEHICLES UNDER ANY CIRCUMSTANCES. THIS IS ESPECIALLY TRUE DURING HOT WEATHER WHEN THE CAR INTERIOR CAN REACH LETHAL TEMPERATURES IN A MATTER OF MINUTES!